I'm not sure what to think about preseason hockey... (yes, this was written almost a month ago). On one hand, it's nice to see the boys in action again after summer, however, the "boys" are usually a collection of prospects and veterans who won't make the team. Despite this, I jumped at the chance to go to a preseason game when Rich Guy asked if I wanted to watch from Richer Guy's suite at Rogers Arena. Furthermore, Richer Guy graciously offered up his parking spot at Rogers Arena as well! Ballin'! Egads... Despite the high-rollin' parking spot and suite, the game was a total bore. I was more interested in tweeting than watching the gam e. As such, I found out that Dee from Meplusfood was at the game and so was Costanza and Snake. After the game, Snake decided to meet up with Rich Guy and myself for some late night eats. At the suggestion from Vandelay (from one of the many phone calls I made during the game), we headed over to the Pourhouse. Or as Snake put it, the poorhouse since he was sitting in the nosebleeds and completely envying our suite deal. After dusting off popcorn and a poutine at the game, I was not exactly hungry so we started with a very modest appie - Devils on Horseback. This version was pitted prunes stuffed with cheese (asiago?) and wrapped with bacon. The whole thing was drizzled with a balsamic reduction. 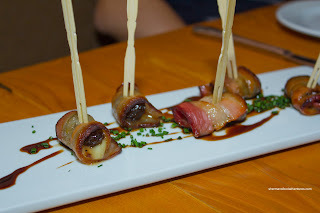 These little bites packed a nice flavour punch which included a salty smokiness from the bacon that worked well with the sweetness of the prunes. Snake really liked this appie and didn't need to be asked twice about the last piece. I guess he needed more fiber in his diet... Do snakes need more fiber? 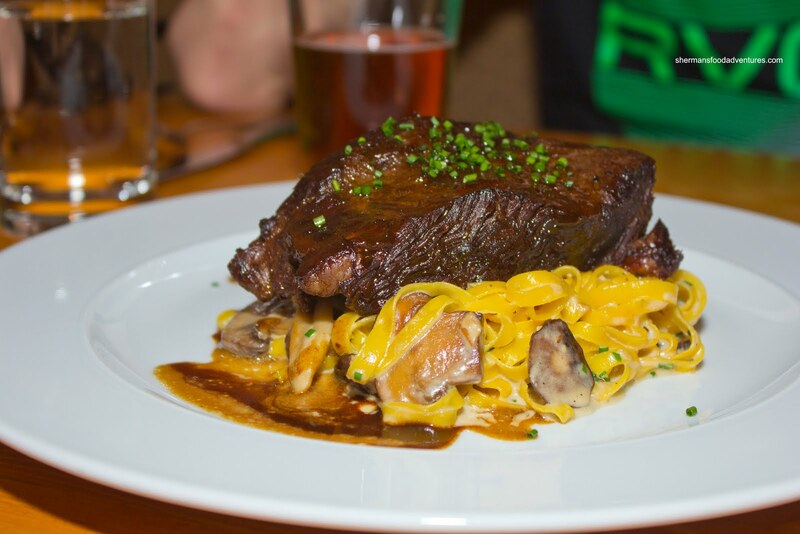 As for his main, he went for the Braised Short Rib with egg noodles and sour cream. It was like a Stroganoff but not. I was able to sample the short rib and it was prepared perfectly. Super moist and tender with a very rich flavour. It was so enticing on the menu that Rich Guy got an order to go for Rich Gal. 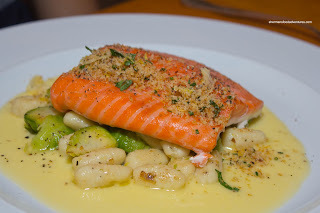 For his meal, he had the Trout with gnocchi, brussel sprouts in beurre blanc. The fish was prepared perfectly. It was moist and flaky, however, it was slightly fishy. The gnocchi was a bit firm, but personally I like it that way. With subtle flavours, the beurre blanc did not intrude on the other components of the dish. 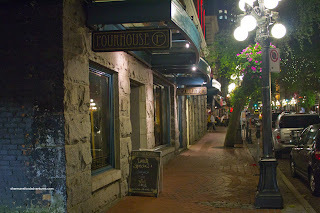 For myself, I was eying the Pourhouse Burger. The meat is ground in-house to order, so I was eager to have it medium-rare. This is the best way to eat a burger in my opinion. Otherwise, the beef becomes dry and much of the juices (where the flavour resides) are lost in the cooking process. 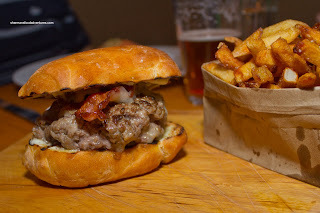 Unlike the one I had recently from The Oakwood, this burger was actually medium-rare. 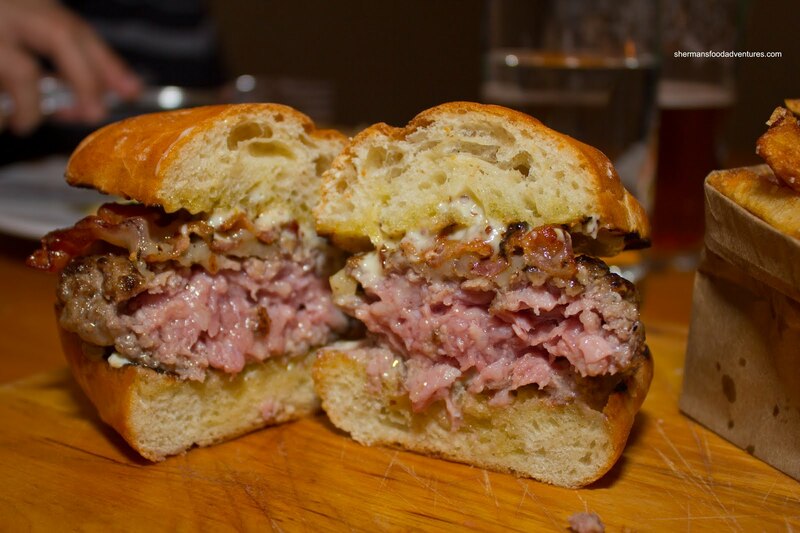 Thus, there was still plenty of rare meat texture and flavour. It may not be for everyone, but I really loved the natural beef juices. In fact, the whole thing was quite greasy from the fat, mayo and whatever else was in there. My mouth, hands and cheeks were completely glistening with oil. Reminded me of my teenage years... LOL... Ah, a messy burger, excellent. As for the side of fries, they were the fried multiple times variety. Hence, they were crisp and full of fried flavour. Yes, I liked them too. Pretty decent eats here at the Pourhouse. I wouldn't have guessed honestly. Sure, the prices are on the higher side and the place is darker than a cave, but it just adds to the ambiance. 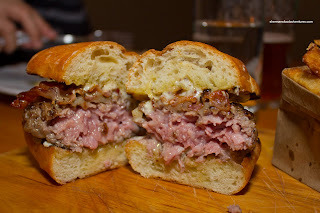 Go for the burger medium-rare, probably one of the best I've had in the city. I came here a few months ago and tried to order a Clamato juice. The waiter curtly told me: "We don't serve Clamato juice here because it has MSG." I thought his tone was a bit of a turnoff. He could have just suggested something else.